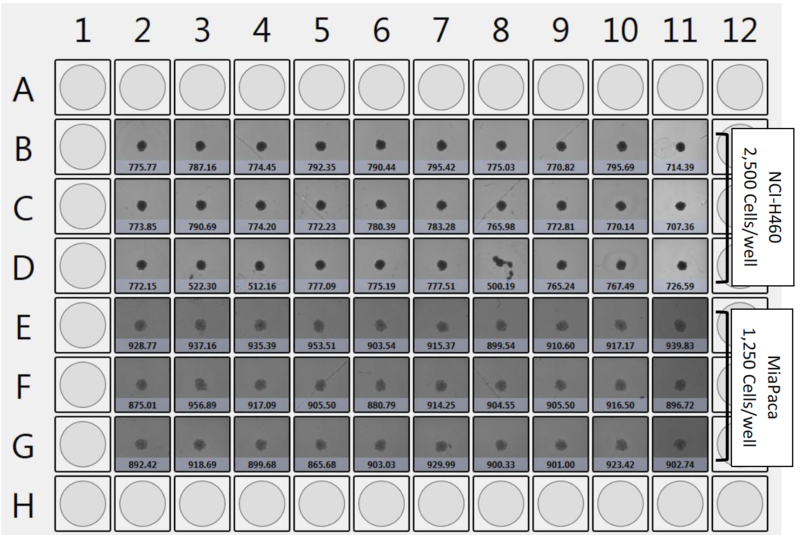 Image and measure the diameter of multicellular tumor spheroids (MTSs) at different drug concentrations that were incubated at either normoxic or hypoxic conditions. Ultimately determine, if incubation conditions (normoxic, and hypoxic) play a role in the reduction of MTS size when treated at different drug concentrations. NCI-H460 multicellular tumor spheroids showed a decrease in spheroid size from 780 µm at 3 µM drug concentration to 750 µm at normoxic and 720 µm at hypoxic conditions at 10 µM. MiaPaca multicellular tumor spheroids showed no change in spheroid diameter between hypoxic and normoxic conditions for control or drug-treated samples. Image and graphed data below represents NCI-H460 and MiaPaca multicellular tumor spheroids treated with Drug X in a dose-dependent manner and incubated at normoxic and hypoxic environment for four days before imaging on the Celgio. The entire plate was scanned in 3 minutes and bright field thumbnails are shown for each well. At the bottom of the well picture is the Celigo measured diameter in (microns) for each identified spheroid. NCI-H460 multicellular tumor spheroids showed a noticeable decrease in spheroid size at 10 µM drug concentration at both normoxic and hypoxic conditions. 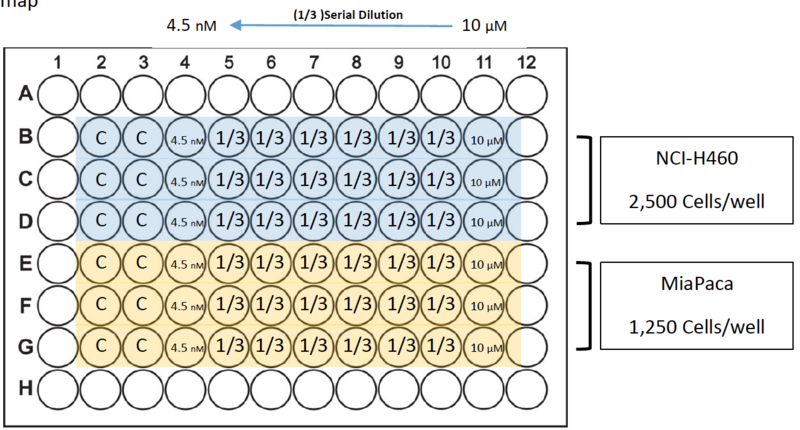 The sizes of MiaPaca multicellular tumor spheroids remained the same throughout the experiment at both normoxic and hypoxic conditions as well as at different drug concentrations. Using the 96-well U-bottom ULA plates, we successfully captured images of MCTS and analyzed the data using the Celigo instrument. 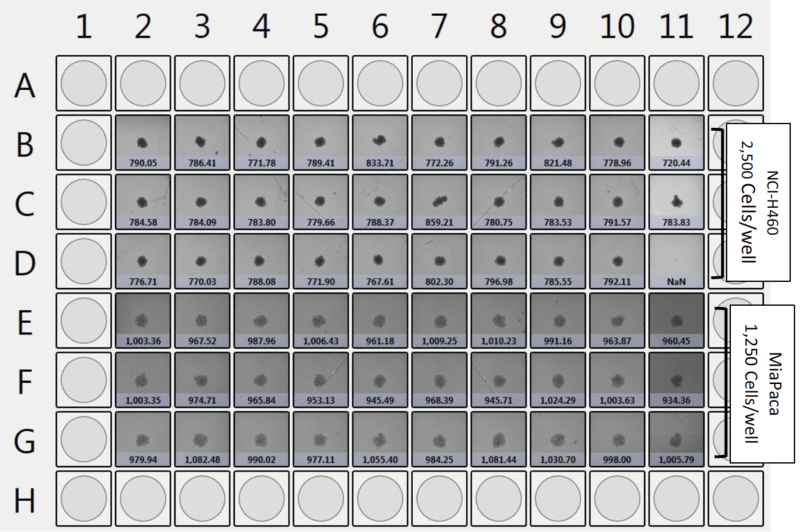 The entire 96-well plate was imaged in 3 minutes. The short scan time significantly increases the throughput during an experiment that has multiple plates.